For quite some time a few things regarding the Western churches understanding of the cross has being bugging me. Some things just don't seem to add up. So I started looking into aspects of the atonement and soon discovered that what we were all taught in church/seminary was known as “Penal substitution”. Penal substitution theory (PST) refers to John Owens theory that Christ died on the cross as a substitute for God’s wrath to be poured out on sinners. The theory was picked up on by guys like John Calvin and Jonathan Edwards who greatly helped in advancing it. Basically, the theory says that at the cross, God imputed the guilt of our sins onto Christ, and Jesus, in our place, bore the punishment that we deserved. At the same time, Christ’s righteousness was then credited to us. This was a full payment for mankind’s sins in terms of its severity, which satisfied both the wrath and the righteousness of God. for a brief moment, God could not even look upon Christ as he bore our sins. The suffering that Christ endured was so that the Father could forgive us without compromising His own just standards. A sort of balancing of His mercy and justice if you will. This is the most common view of the purpose of the cross within the larger Evangelical circle today. Many are not even aware that alternate views exist. Even John Piper writes in the foreword of the book, Pierced for Our Transgressions, "For if God did not punish his son in my place, I am not saved from my greatest peril, the wrath of God". This presentation of the cross surely sounds familiar to most people and maybe you are even nodding your head as you read along. Although there is some truth in the above theory, the more I have looked into it, the more I have realized that most of it is seriously in contradiction to a lot of what scripture teaches us about the cross, about the Father and about the Trinity. I have divided my thoughts up into three sections below. The first part are the scriptures that came to mind while the second part are the logical problems I could think of. The last part is a re looking into scriptures that are used to support PST. PS - Before posting this I quickly re read it and quickly realized that it does not flow very well as I wrote it in a point format. Please forgive my lousy writing skills. If the topic interests you, it is worth overlooking my lack of eloquence ...now, let’s get stuck in! What’s wrong with Penal substitution? …For He has not despised nor hated the affliction of the afflicted; and He has not hidden His face from him, but when he cried to Him, He heard. Similarly, we see the Father not playing the role of the bad cop, but as being actively involved at the cross in helping His son. I gave My back to the strikers, and My cheeks to pluckers; I did not hide My face from shame and spitting. For the Lord Jehovah will help Me; therefore I have not been ashamed. On account of this I have set My face like a flint, and I know that I shall not be ashamed. He is near who justifies Me; who will contend with Me? Let us stand together; who is master of My judgment? Let him come near Me. Behold, the Lord Jehovah will help Me; who is he who shall condemn Me? Lo, they all shall wear out like a garment; the moth shall eat them. Further evidence that the Father was helping, rather than punishing His son in 2 Corinthians 5:19.19 whereas God was in Christ reconciling the world to Himself, not imputing their trespasses to them, and putting the word of reconciliation in us. In harmony with the opening scriptures of Isaiah 53, we see in Luke 22:53 that the violence displayed at the cross was an act darkness, rather than light. 53 When I was with you in the temple daily, you did not stretch out your hand on Me. But this is your hour, and the authority of the darkness. NB - I believe that the cross was not dealing with the Fathers dilemma of needing to exact some sort of revenge on humanity before being able to forgive us. But rather that He was dealing with the problems of sin, the devil, and ultimately death that had befallen us. As the verse below indicates, the cross did not make the wrath of God of no effect, but rather, the power of death. A similar statement is made in Rom. 6:9-10 knowing that when Christ was raised from the dead, He dies no more; death no longer has dominion over Him. 8 He who practices sin is of the Devil, for the Devil sins from the beginning. For this purpose the Son of God was revealed, that He might undo the works of the Devil. Hebrews 2 is an important chapter in atonement theology and worth reading in it's entirety in your own time, for our purposes here though, verse 14 echoes 1 John 3:8 above nicely. 1 - Does the problem of sin lie with an offended God or with broken man? In Christ’s death and resurrection, who was he “fixing”? 2 - Is it just to punish the innocent? I am astounded at how we can say because God is just he had to punish someone, even the one who knew no sin! Even Pilate did not want to be identified with such an injustice. Any human that would murder the innocent would greatly offend us. Yet we apply the same logic to God and call it "just and holy"? 3 - Can God not forgive freely? This is something God expects of us, it is part of the essence of love which “keeps no record of wrongs”. According to a retributive definition of justice, God indeed cannot freely forgive. 4 – PST claims that in order for God to satisfy his retributive justice, Jesus had to endure the exact punishment that was due for all of humanity. Think about it, 1 man suffering, albeit terribly for 8 hours, weighed against the whole of humanity suffering in hell forever? That is maybe a 100 Billion people burning in eternal fire…not to take away from Christ’s suffering. But if you had to choose one of the two tortures for yourself, which one would you go for? 5 – It has being stated by many that PST is a form of “Cosmic child abuse”. A Father who delights in the suffering of His only begotten son at His own hands, this is a terrible way of viewing the cross. It is incredible how many atheists blog about this as one of the main reasons that they left Christianity (apart from the hypocrisy of many church folk). 6 – Most of our atonement thinking is rooted in our concept of justice. Biblical justice is restorative, not retributive. I have blogged previously n this so instead of elaborating as this post is already getting long, please look up the previous article on justice. 7 – PST throws God in with the pagan deities who required a sacrifice (preferably ones own son) in order to be appeased. Sacrifice is often associated with cleansing in scripture, it is not punishment, but rather an alternative to it. 8 – PST separates the trinity, and not just in the sense that the Father could not look on the son, but in that there are needs in the Father that are opposite to the son, one can't look on sin, the other is a called a friend of sinners, one seeks to punish, the other seeks to save. 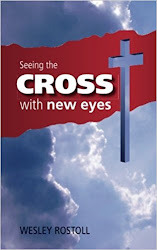 9 – If the cross was indeed about satisfying the Fathers wrath, then Jesus failed. The bible has sooo much to say about Gods coming wrath, read the minor prophets, read Revelation. If you have E-sword just search “the day of the Lord” and see how many verses pop up. God’s wrath and who or what it comes against is an interesting but separate topic which hopefully I can address here in future as well. Isaiah 53:10 - Yet it pleased the LORD to crush Him; to grieve Him; that He should put forth His soul as a guilt-offering. He shall see His seed, He shall prolong His days, and the will of the LORD shall prosper in His hand. This verse is the one people will always bring up, but when pushed on it, no one will admit that they believe the Father took pleasure from the torture or murder of His son. Rather this scripture says to me that the Lord was pleased with the plan or outcome of Christs sacrifice. It is very interesting to note as well how the Septuagint translates this verse, keep in mind that this would be the translation as Jesus and the apostles would have read it. 53:10 - But the LORD chose to crush him by disease, that, if he made himself an offering for guilt, he might see offspring and have long life; And that through him the LORD’s purpose might prosper. Heb 9:23 - And almost all things are by the law purged with blood; and without shedding of blood is no remission. Most people like to say “without the shedding of blood there is no forgiveness of sin”. There are 3 things worth pointing out though. 2 - Although the Greek word "aphesis" can be translated as forgiveness, remission is far more fitting as translated above. What do you think of when someone says that someones cancer is in remission? This goes nicely with the theme of us being healed by his stripes. 3 - Keeping with the idea of Christs blood bringing us healing as opposed to satisfying the Fathers blood lust. Hebrews 9:23 is made more clear by the preceding statement in verse 14. "how much more shall the blood of Christ (who through the eternal Spirit offered Himself without spot to God) cleanse your conscience from dead works to serve the living God?" The verse below is another one that gets used sometimes. The same principles of blood mentioned above apply here as well. But something else people don't always know is that justice and righteousness come from the same word in the Greek, "dikaiosune". These words have very different meanings to those who fly the PST flag. Consider replacing the word "justice" or "justification" with "righteousness" or "right standing" and visa versa. They mean the same thing but modern translations like to ascribe the word that best suites their bias. I have inserted justice and righteousness in brackets below after the words as we read them. You can check this using E-sword as well. I hope it gives you a clearer understanding of Gods justice. It is NOT the opposite of His love, but part of it in a restorative sense. 26 for the display of His righteousness (justice) at this time, for Him to be just (righteous) and, forgiving the one being of the faith of Jesus. I wanted to cover as much as possible here but still, I have only touched on a things without going deep into them. There is plenty of great resources to be found on the topic on the web and I would really recommend Brad Jersak's book" Stricken by God" for those seeking to dig deeper.